MILWAUKEE (November, 2013) – The Harley-Davidson Motor Company and Screamin’ Eagle® Factory Flat Track Team are excited to announce that 2013 AMA Pro Grand National Champion Brad Baker has joined the team as its factory rider for the 2014 season, carrying the company’s long and proud tradition of flat track racing forward into a new generation. 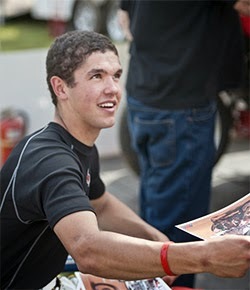 The 20-year-old Eatonville, Wash. resident, who became the fourth-youngest rider to win the Grand National Champion when he clinched the title at the 2013 season finale at Pomona, Ca., joins a long and illustrious list of Harley-Davidson Factory Team riders, including legends of the sport such as Joe Leonard, Carroll Resweber, Jay Springsteen, Scott Parker, Chris Carr, and Kenny Coolbeth. Baker won the AMA Pro Singles Championship in 2009 before moving up to the Expert Twins class and winning the 2011 AMA Pro Flat Track Expert Rookie of the year award. In 2012, he rode two races for the Harley-Davidson Factory Team as a substitute for injured Factory rider Kenny Coolbeth, before joining the Dodge Brothers Racing team for the 2013 season. Baker won two Expert Twins races this season riding a Harley-Davidson XR750, including the Pomona finale, in addition to earning the Grand National Singles title to claim his first overall Grand National Championship title. “Brad was a rising talent in 2012 when he rode two races for the Screamin’ Eagle team, but by winning the Grand National Championship this year he proved he is a star of the present and future, which makes him the perfect rider to lead our flat track racing program into the future. We have a lot of exciting plans for the program and Brad in the coming year, and we can’t wait to go racing,” said Harley-Davidson Racing Manager Kris Schoonover. Baker will contest the AMA Pro Grand National Twins series aboard Harley-Davidson XR750 motorcycles prepared by tuner Craig Lager. Kevin Atherton, the 1988 AMA Pro rookie of the year, winner of 14 AMA Pro national races, and the youngest ever member of the Harley-Davidson Factory team, will also join the team as Baker’s riding coach and mentor. Rotterdam, 29 november 2013 – Vorige maand heeft Eric Buell Racing de langverwachte sportmotor, de EBR 1190RX, onthuld op de American International Motorcycle Exposition (AIMExpo) in Orlando, Florida. Deze straatlegale, high-performance motorfiets is afgeleid van EBR’s 1190RS Super Bike racemotor en beschikt over tal van features die hem in het competitieve segment van de sportmotoren zeer concurrerend maken. De EBR 1190RX is tijdens de Rotterdamse Autosalon voor het eerst in Nederland te zien, op de stand van Pietersen US Cars & Bikes, de inmiddels vermaarde specialist voor Amerikaanse motorfietsen, zoals Harley-Davidson, Victory en Indian. De nieuwste Amerikaanse motorfiets weegt slechts 190 kg en de 1.190cc V-Twin levert maar liefst 185pk en een koppel van 138 Nm. Maar weinig productiemotorfietsen hebben dit maximumkoppel ooit gerealiseerd. De brede koppelkromme van de 1190RX verzekert berijders ervan dat overvloedig vermogen in elke versnelling voorhanden is en de 21 standen van het tractiecontrolesysteem zorgen ervoor dat dat vermogen onder alle omstandigheden op de weg kan worden gebracht. Het baanbrekende ontwerp van de motor en EBR’s op de racerij geïnspireerde handlingprestaties worden gecombineerd met een fraaie styling en wetenschappelijk bepaalde aerodynamica waardoor de 1190RX de strijd met iedere concurrent aan kan. Met het multifunctionele digitale instrumentencluster kan de berijder de prestatiesettings naar wens beïnvloeden, zoals de tractiecontrole, en voorziet het in tal van andere functies, waaronder prestatiedata op het circuit, service intervallen en systeemdiagnose.